VSCO Film - is the gold standard in the field of presets to give your photos the effect of film fotoapparotov.VSCO Film presets are based on the individual profiles of the camera. If you want , for example, to recreate the look of Polaroid, Kodak, Fuji or other types of film in a manner different from the standard application of the general changes to each photo. Native Adobe Lightroom controls and functionality enable you to get the look you want without ever leaving the Adobe Lightroom environment. VSCO Film is NOT a plugin! VSCO Film 01 utilizes Lightroom?s new 2012 process and includes custom camera profiles for Fuji, Canon, Nikon, Sony, Olympus and Leica, as well as RGB curves, resulting in even greater realism in film emulation. Improved control of color tones and contrast mirror the subtle nuances of analogue film. VSCO Film 02 utilizes Lightroom?s new 2012 process and includes custom camera profiles for Canon, Fuji, Leica, Nikon, Olympus and Sony, as well as RGB curves, resulting in even greater realism in film emulation. Improved control of color tones and contrast mirror the subtle nuances of analogue film. VSCO Film 03 introduces the beautiful tones and magical tints of instant film to the digital realm. Built from the ground up, VSCO Film 03 for Lightroom 4 & 5 utilizes Lightroom?s new 2012 process, as well as RGB curves resulting in even greater realism in film emulation. Improved control of color tones and contrast mirror the subtle nuances of analogue film. VSCO Film 03 also includes new custom camera profiles for Canon, Fuji, Leica, Nikon, Olympus and Sony, as well as custom tools like Clarity Down, Sharpness Down, Old Lens and various Toning looks tailored to achieve an accurate & authentic Instant film look. 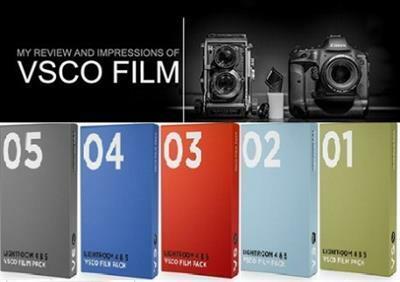 Is composed of bold slide film emulations that deliver high contrast and colorful images. An excellent "all-around" pack, VSCO Film 04 excels in photojournalism, street photography, fashion, landscapes and travel. VSCO Film 05, a new collection of 185 presets, mimicking a dozen classic "archetype" films from the heyday of analog. Compatible with Lightroom 4 and 5 as well as Photoshop CS6 and CC, the Archetype Film Collection "represents our finest digital emulations to date, the embodiment of these nostalgic film stocks."